The Libraries and the Intellectual Heritage Program present an exhibition of Afghan War Rugs, traditional hand knotted carpets that combine ancient practice with the latest in the daily lives of the weavers. 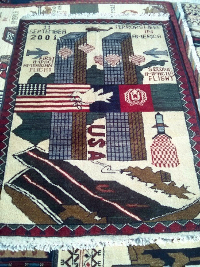 Many of the rug designs originate in antiquity, but since the 1980's now incorporate the war that spans from the Soviet invasion through today's battles with the Taliban. The weavers have witnessed epic historical events, encoded them in their traditional art, and wrought important contemporary art. Curated by Alicia Cunningham-Bryant and student assistant cuators Ilana Napoli and Rachel Morin. These materials are generously on loan from Kevin Sudeith. Curators made selections from website, then Kevin Sudeith selected rugs to approximate their selections. Najibullah: Exhibited at Denison University Art Museum and John Jay College of Criminal Justice. Sold to Miss Kathy Guild March 2012 Formerlyu sales status 21 Returned by MKG and exhcnaged for 1515.